Boss Bowser and Bowser Jr.
Not to be confused with World 8-Castle. World 8- Bowser's Castle is the twelfth and final level of World 8 in New Super Mario Bros.. This level is home to Bowser, the final boss in the game. This level takes place in Bowser's Castle. Mario must first enter the door in the first room. If he hits the ? Switch from one of the blocks, the will turn room upside-down. In the next room, there are several Burners. After going through the door at the very right of it, Mario will arrive in a room with a Thwomp. After turning the room upside-down and entering the door, Mario will be in the Burner room again, but this time with the entire room upside-down. After going through the now-accessible door, the player will end up in the room where they will have to avoid the Thwomps and spikes. After turning this room upside-down, they will have to enter the door at the top of the area. In the next room, the player will have two doors to choose from, and the difference between both is that the left door will take Mario to the Star Coin and the right door will not. 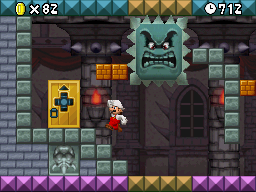 The player must go through the door at the top from the door chosen before, and Mario will reach the Checkpoint Flag. Mario will have to take the correct paths to make it to the end. If Mario uses the correct path, a ding sounds, while if Mario goes through the wrong way, a dull buzzer sounds. At the end of the room is the final door, where Mario will battle Bowser and Bowser Jr. to save Princess Peach. Star Coin 1 - In the fifth room, in the top-left section of the room, Mario must avoid the Thwomps while collecting this one. Star Coin 2 - In an unreachable room underneath the stairs. In the fourth room, avoid the Burners, Mario must jump over a big gap containing spikes, hit the lone Brick Block to reveal a Red ? Switch and press it while avoiding the Burner. Mario must then proceed to the fifth room, avoid the Thwomps, hit the Brick Block to reveal a ? Switch and press it, then return to the fourth room and jump onto the platform and enter the door from there, and find the Star Coin underneath the stairs. Star Coin 3 - In the second part of the castle, after jumping on the platforms in the correct order (bottom, top, then middle), Mario must Ground Pound the Brick Blocks, go up the stairs and run down the stairs then crouch before entering the small opening to collect the third Star Coin. This page was last edited on March 7, 2019, at 18:33.